Paso Robles, CA – July 8, 2015 – In 2008, the City of Santa Maria purchased 1111 West Betteravia Road knowing they had already outgrown their current headquarters, in use since 1953 in the rapidly growing city. Now, Santa Maria is the largest city in San Luis Obispo and Santa Barbara counties, but before the doors could open at the new station on June 22, 2015, it had to pass a final walkthrough. The concrete floor didn’t pass. The full cost the new station, including the purchase price of the building and land, and the custom modifications for a modern crime lab and communications infrastructure, was about $29M. The city had cut costs where possible, even buying used office furniture from the previous tenant. But during the Construction process, the concrete floor began to fail. At the 11th hour of the project, the City of Santa Maria needed to hire an experienced concrete contractor, one who could handle a government contract for their nearly 72,000 square-foot building and also be someone they could trust. When Mike Boeddeker of Pristine Concrete got the call, he knew right away they were going to need the RetroPlate Concrete Polishing System because of its permanence and durability. The last thing a police station needs is the cost and hassle of the upkeep on a limited-life concrete flooring seal. Reducing maintenance for the City of Santa Maria is a big win, but Boeddeker knew RetroPlate™ could offer more and he would still be done in time for the City to move into the new building before June 22, 2015. Boeddeker has experience in other industrial, commercial, and government concrete contractor jobs with his team at Pristine Concrete. Based out of Paso Robles, the team handles concrete refinishing, polishing, and staining in Santa Barbara, San Luis Obispo, and Monterey Counties. One big signature to his work; branding. “I wanted to include more in the flooring at the new police station than just a concrete stain,” said Boeddeker. “A new building like this is a great achievement for the City of Santa Maria and for the men and women who serve this area. I immediately made plans to incorporate their colors and shield into the floor as part of my repair to give their new office something really special. It took a lot of work to complete their concrete floor in time, but we still used an 800-grit concrete polish to make sure that floor will hold a pristine shine for years to come, even with the abuse it’s likely to get as a working police station.” The police can be tough on crime, Boeddeker will be tough on concrete and what he demands from it. 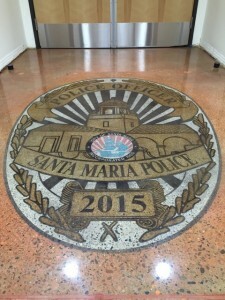 If you find yourself at the new Santa Maria Police Station, be sure to look down and see the work from the team at Pristine Concrete. Wow! What a great job these guys did. 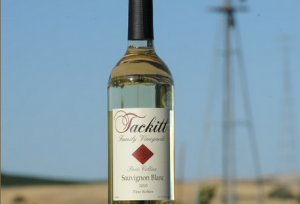 Mike, we can’t thank you enough for the great work that you did on our tasting room floor. We appreciate the extra mile that you took with our job supporting our troops and the EOD Warrior Foundation. Your company is top notch!